These double Narcissi are really outstanding. They provide a stunning display of scented showy blooms always making a great feature in any garden. Easy to grow they flower year after year with those famous double blooms that everyone admires. Sitting high on 40-60 cm stems they make a great cut flower, or when planted in bold clusters in the garden have a striking effect. Plant the Daffodils 8-10cm deep, 10-12 cm apart in well worked soil, preferably in a sunny, free draining position. If drainage is a problem, plant shallower and mound the soil over the bulbs. Never cut back or remove the foliage until it has died down naturally. Available from mid-February through to May and is best to be planted straight away. 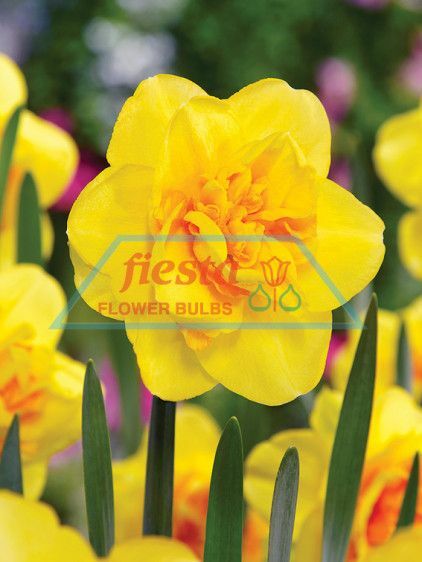 For best results year after year feed with Fiesta Bulb Food.